Friend of Kotaku Jack Thompson was kicking back at his Florida home today when there was a knock at the door. "Whoever could it be? ", he probably asked himself as he set his morning coffee down on the table. 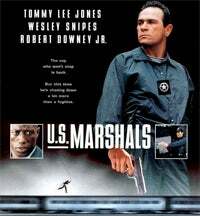 Opening the door, he was greeted by...a pair of US Marshals. Who had been sent to Jackie Boy's home by Judge Federico Moreno. Why? Oh, probably because Thompson sent a letter to Moreno last week, which ended with: "We find yesterday that enemy combatants at Guantanamo are to get more due process from federal judges than what I am to have. I guess my "mistake" was not killing 3000 people to make my point...". Guess the killing 3000 people thing didn'go down very well with the Judge. While Thompson stresses the Marshals were "nice gentlemen" sent only to warn him about sending those kind of letters, he's less kind to Moreno, who he accuses of trying to intimidate him by sending the pair. As such, he's going to complain to the House Judiciary Committee in Washington, accusing the Justice Department of harassing him. Oh dear.